Includes one burnished silver Aquaman Trident. 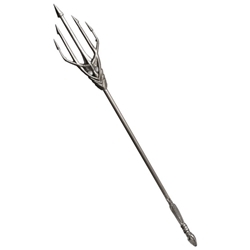 The trident is made of plastic and has a handle that measures 36" and a five prong head that measures 18" with an overall length of 54"
The Aquaman trident is based off of the trident used by Aquaman in the comic books. Aquaman is a superhero from the DC Comics universe and is a founding member of The Justice League of America. His superpowers include super human abilities and telepathy/mind control of aquatic life. This trident can also be used for the character of King Triton in The Little Mermaid. *Due to the size of this item additional shipping charges have been added to the sales price and it cannot be shipped via 2nd Day or Next Day Air.